Amazon CEO Jeff Bezos announced his company’s first smartphone in Seattle on Wednesday, the Fire Phone, by first turning to a curiously ironic metaphor: a bucket of water. “You can fill a bucket with an eyedropper, if the bucket doesn’t leak,” Bezos said, striving to convey Amazon’s success at getting and keeping customers for its Prime subscription service. Now those Prime customers have a new reason to immerse themselves deeper into Amazon’s bucket of devices and services: a smartphone designed just for them. There are a four things special about the Fire: Dynamic Perspective, Firefly, Mayday and camera with unlimited photo cloud storage, but the only things that matter — Firefly, Mayday, unlimited cloud storage — are not even hardware based. If Amazon chooses to keep the Firefly exclusive to the Fire, it would mark a big strategy change. My bet is Amazon will stay open and have its services available everywhere, and therefore will eventually port Firefly to other smartphones. Because of that, I wouldn’t recommend what’s otherwise a pedestrian if not gimmicky phone in the Amazon Fire. Unless it’s for that non-techie relative who just needs Mayday. This was the feature that the press couldn’t stop talking about. Dynamic Perspective, with its 3D effects and hands free navigation, is made possible with four cameras on the phone that track your head position. Hands free navigation – Head tracking makes it possible to navigate by tilting the phone or moving your head. Supposedly, this works much better than what Samsung and LG attempted with the accelerometer (to horrible results). Hands free navigation fits better with the Fire given the two universal menus accessed by edge swiping left and right; so a quick tilt either way would accomplish the same thing. It’s an ambitious idea — can you take the finger out of navigation as much as possible? People who like to read on a crowded bus might appreciate this, but I wonder how the phone handles unintentional head movement. Overall, this is addressing a tiny problem as finger navigation is fine for most folks. Dynamic Perspective is the kind of attention grabbing feature marketing folks love but actually has limited use. Like Siri when she first debuted on the iPhone 4S. The Fire has a 13-megapixel camera with f/2.0 lens and optical image stabilization, which means the Fire can take better photos in low light and on the move. This by itself may not mean much, but couple that with the unlimited cloud storage for photos and the Fire becomes an interesting camera — especially for people who don’t know how to (or even why they should) set-up third party cloud storage solutions. You wonder why other companies won’t follow suit. This is a “call for help” button. Not sure how to do something? 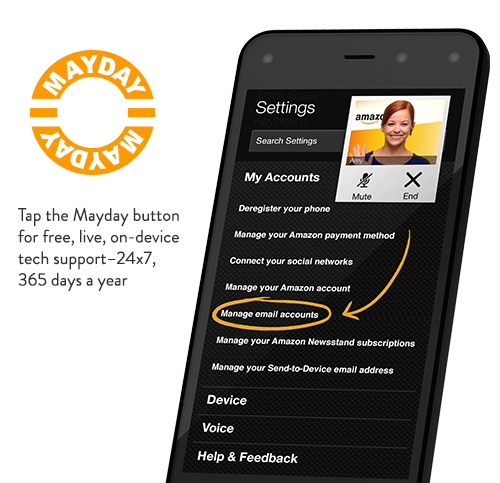 Tap the button and Amazon’s customer service officer will help you out in a live video chat. The company claims the average connection time is a mere 10 seconds (on the Amazon Fire HDX tablet), which is amazing. This is an awesome feature, and I might recommend the Fire to a non-tech savvy relative on this basis alone. As you might guess, this my favorite feature of the Fire. Firefly is a tool where you can identify objects, text, audio and more by taking a photo of anything or having the app listen to something. It’s connected with the Amazon marketplace so you can easily purchase the item analyzed; it’s also connected with other services so, for example, after detecting a song you can make a playlist of it with your music app. It’s kind of like Amazon Dash but software based and way beyond groceries; and a far more evolved version of Amazon Flow for iOS, which was limited in what it could successfully identify. Imagine seeing a wine bottle, scanning it with Firefly, and then getting information about it from Wikipedia with a link to purchase it on a wine website. Firefly is about connecting the offline world to the online one. Your personal compass for acquiring real world things. I also love the firefly effect — little dots that fly around the object being captured to show the app is performing work and to communicate what it’s analyzing. It’s a fantastic UI touch. Firefly can supposedly identify over 100 million things. Is this something that could only work on Amazon hardware? No. 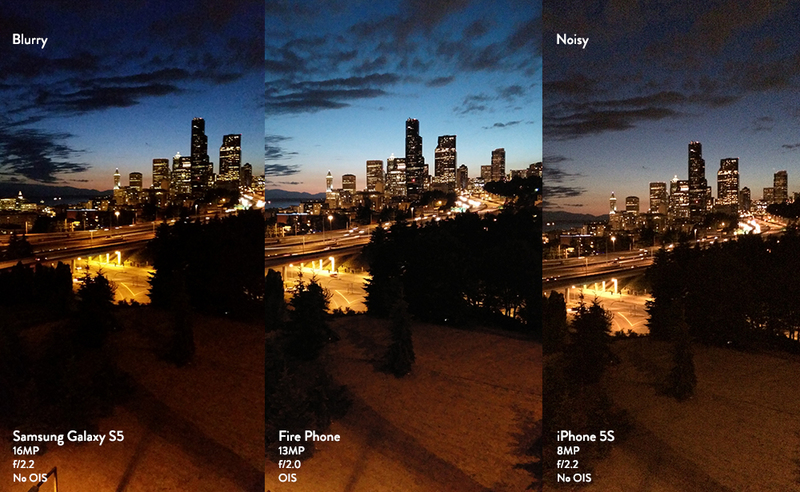 This is an app that could easily work on other smartphones. It would say a lot about Amazon’s strategy if they keep Firefly exclusive to the Fire: whether they want to be like Apple, who marries proprietary software to hardware; or like Google, who wants their software and services accessible from everywhere. For my money, Amazon is still more like Google and will eventually make Firefly available on other smartphones. Their end goal is to get you to buy from their marketplace. Since my favorite feature of the phone will be made available elsewhere, I can’t recommend it. Dynamic Perspective is cool but probably just a gimmick. The camera and unlimited cloud storage are compelling; but it’s not as if other smartphones have lousy imaging solutions. Other than Firefly, the only feature that really stands out is Mayday, so I would recommend the Fire only to those who care about it (there’s more of them than you think). Beats some random aunt calling me for support! The Cornerplay does a mini-dance -- we're on Techmeme!